Any attempt to open a new front in support of legalising trade in rhino horn based on practical realities is greeted with the same old pithy assumptions, illogical speculation and a renewed call for more state contributions to overstretched budget. Everyone is by now familiar with the targets trotted out as the cause of failure to rein in poaching; law enforcement incompetence, official corruption, bad apples in the private game ranching sector and of course those old chesnuts, Chinese criminal syndicates and Chinese consumers. This response is invariably followed by yet more impassioned appeals for public donations from what has become an army of NGO’s. Its big business with an international footprint and the ability to penetrate high levels of authority in order to gain traction. Please, will someone tell the pyromaniacal high priests who conduct these symbolic sobfests that they need to find something a bit more original to say while setting the pyre ablaze than “ this will send a strong message to the criminals . Burning it and ridiculing it is an excellent idea. And those who try to sell it should be publicly condemned …..and that includes, it would appear, John Hume’s for holding his legitimate auction of harvested horn. It’s an intonation that, in light of the 6000 rhino slaughtered since this ritual was first held, has become more than just wearisome. Just as the admonition to youngsters to “stop eating fast food” its bad for you” is simply ignored so too will this one be. 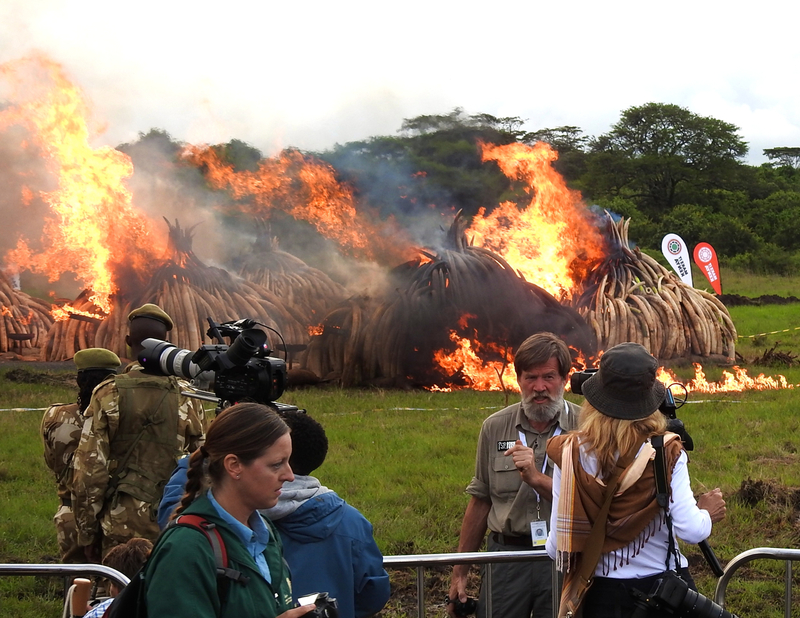 Someone should ask Leakey what happened to the African elephant population after the 12 tons of ivory he and Arap Moi set aflame in Kenya in 1989 as a gesture of a valueless commodity. Poaching simply increased. Just what kind of alternatives to an embarrassing host of failures on the part of NGO’s and Govts. persisting with a string of measures in a bid to stem the tide of poaching might be considered in the face of such a worsening situation? A well respected, asset manager and wildlife economist who has made a significant contribution to an understanding of how a legal regulated market for rhino horn (and elephant ivory) could work, estimates ,for example, that the proceeds of sales of ivory from natural elephant mortalities alone in Africa could finance the budgets of a host of formally protected areas, parks currently in decline as Govts. fail to vote the necessary financial support for their maintenance. Then there is a legal trade in rhino horn harvested from living rhino.The accusation persists that a legal market in rhino horn could not possibly sustain the demand. Agreed – that is perfectly true were we dumb enough to price it incorrectly; but not if rhino horn is offered on the principle of a moderate discount, say 30%,to the actual cost of poached horn. A syndicate criminal is not going to pass up the opportunity to legitimise his business through buying legal horn and ivory – at a discount – and what is more acquiring stock, exporting and selling it without having to take any of the risks associated with financing poaching and all its subsequent stages of illegal access to consumers. It’s the logic of free market economics. And please lets stop that nonsensical notion that the pro trade lobby wish to “flood the market” – for the umpteenth time, kindly note, it’s a sustainable, regulated trade we seek! The National horn stockpile is stated to be over 40 tons ) worth billions and billions of rands. Imagine how far that would go in shoring up beleaguered conservation agencies and helping to deter poaching by creating a disincentive for criminal activity whose sole means of securing product to supply to the market is to finance poaching to say nothing of the positive effect this would have on private rhino ownership currently sitting without a cent of state assistance in financing rhino security. The real tragedy in this saga ,however, lies in neglect by Govt. of those rural communities who failed , or chose not to move, to an urbanised existence and remained scattered in fragments of a proud tribal past in those areas now peripheral, and pressing in, upon protected areas. There is hardly a single prominent protected area that does not suffer from this peripheral anachronism of poverty existing side by side with what are the happy hunting grounds of wealthy tourists whether it be KNP or Zululand, Kenya or Zimbabwe. Lets be honest about it. Most of us will admit to a palpable sense of relief on entering the gates of the reserve or park we are visiting after passing through a degraded landscape , children in rags playing in dusty spaces between mudhuts, woman bearing water canisters on their heads and scrawny cattle and goats on overgrazed spaces. It has become a commonplace experience .Best example is KNP where a reputed 2 million people eke out a living ,some in abject poverty, on community owned land bordering the KNP. Apparently only some 17% have ever entered the park as visitors. This does not augur well for the likes of the embattled anti –poaching forces sustained through industrial amounts of tax payer and donor funding attempting to forge pre –emptive cooperation with locals against poaching. That kind of approach is likely to become even more unrealistic in a declining economic climate. Ezemvelo’s Zululand parks are really no different – islands surround by very poor people many unemployed. At a DEA Stakeholders convention held two years ago in Boksburg on the rhino trade controversy attended by a number of traditional rural community leaders, the opportunity to empower a much neglected class of people in rural areas through the development of intensive rhino management projects and the harvesting of horn for sale on a legal market , was thoroughly aired. Speaker after speaker urged that legalisation of trade be introduced gifting the Govt. with a perfect opportunity to confront CITES at the upcoming CoP in JHB in 2016 with an argument based on the most precious of all arguments – the upliftment of rural human welfare based on sustainable use of natural resources. A curious paradox emerges .If the Govt. decided, in spite of what was a glorious opportunity to uplift rural communities, not to cross swords with CITES and take the plunge by ceasing membership of that body, does it not beggar belief that the same Govt. did not turn a hair in cocking a snoot at the international criminal justice system and the Rome Statutes . What hidden motives were at play by deciding not to seek a lifting of the CITES ban on export trade for white rhino horn. One would have thought, given the relative strength of South Africa’s case – holding 80% of the Africa’s rhino it is indeed strong – for seeking a lifting of the ban on horn at CoP in 2016 was an extremely powerful one in comparison to thrusting two fingers at the civilised world over the Sudanese President. But no, when it comes to investing in the economic welfare of its own rural people and at the same time creating an economic intervention to depress rhino poaching and uplift biodiversity conservation, the act of confronting CITES in order to conduct a legal trade in horn using legal horn derived from perfectly legal sources ( and the official stockpiles of course ) was given the widest of berths – the opportunity of a lifetime wasted . In the contentious issue of deprivation based on lopsided land ownership in South Africa it becomes abundantly clear that many communities occupy largely marginal , non –viable agricultural land – poor for most forms of agrarian use but eminently suitable for running a White Rhino farming operation. John Hume the lead private owner intrepeneur has proved this through various business models based on his highly successful intensive management of rhino and horn harvesting on a number of ranches he owns in Limpopo province. So while ANC politicians rave and rant about the monopoly of white land ownership and the urgent need for radical economic transformation, here on the borders of KNP and any other African Park you may care to name, are communities who have a) a crying need for upliftment b) the ideal land resources for rhino management and a system of sustainable utilisation that would enable them through mentorship ,to transcend economic deprivation by a quantum likely to outperform the profitability of the best agricultural land in the country !